The word YOGA in Sanskrit translates to yoke, or to bring together. I recently had Kari Martin, a guest teacher from Australia teaching her wonderful Zenthai 5 elemental yoga series at the YOGA JUICE studio. She’d told me about a couple who ran a River Walk Ecotour and Accommodation business called Lalotalie. She raved about the walk and the conservation work the couple were doing out there and it was my intention to go out and meet them with Kari whilst she was still on island. Alas that didn’t happen because of rain, but the seed had been planted. As one of my little treats for being on the 30 day alcohol free challenge I decided to go with a group of friends to check out the tour. Now I’d been out to Lefaga and snorkeled over the giant clams but I’d thought that’s as far as the touristy stuff went out that way. So on Mothers’ Day 9 of my yoga compadres and I ventured out nice and early to Lalotalie ECAT Ventures. Lalotalie ECAT Ventures is located directly beside the famous Liua le Vai O Sina River. Lalotalie literally means “under the talie tree” - a wide leafy tree providing a shady place to meet, rest and relax, exactly what is needed after the most fabulous hike on the island. We were greeted by Jane and Olsen Va’afusuaga, the carers of the land, they gave us a quick briefing on what to expect (underneath said lalotalie tree), a quick tour of the property and a humble rundown on the conservation work they do with the locals on the land out there. 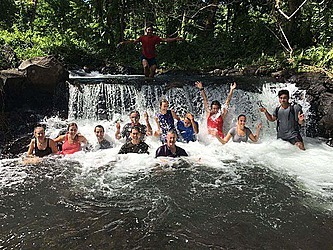 With packs on backs, our group of nine with four tour guides gingerly trudged into the river alongside the property – knee deep, then waist deep in rushing water and it wasn’t long before someone fell over and the fun began. This is a five hour walk with 14 waterfalls along the way. When we arrived at the first of the waterfalls five of the bravest scaled up the rock face with the guides and jumped, I was one to sit and watch and take photos (the only pix I took on the tour). Those of us on the sidelines had a little swim and talked amongst ourselves about our fear of heights and how the day would most likely be spent watching and wading leisurely. On we waded to the next waterfall – this one was different, easy access to underneath the falls and a seven foot jump into the water, but it was this jump that we all did ... the jump that gave us that nice little surge of adrenalin that would excite us into doing many more of the waterfall jumps. The guides were brilliant, as they acrobat jumped and scaled they talked about local flora and fauna and conservation, they pointed out the work they are doing with the locals and the M.N.R.E. Water Resource Division who have donated over 8,000 native tree seedlings. This tour is true ecotourism. As we walked further, swum and jumped more, we came to rest as Olsen (our lead guide, and carer of the land) sat us down and shared with us a beautiful local legend about Sinafatulua, a Goddess Queen who lived high in the mountains and how she gifted that very river to the villages and the importance of respect and love for the rivers. Olsen is so passionate about the land there and takes his work alongside the Falease’ela Environment Protection Society very seriously, He’s so impassioned that it’s hard not to get the bug. There were many moments along the tour where I became teary-eyed at the beauty of the forest and the rushing water. This has been by far the best thing I’ve done in Samoa and I’ll suggest to everyone to do it, but being conservationists you might find that tours aren’t always available because these people are working a lot to keep the land pristine and helping the locals to create sustainable livelihoods. Once the tour was over, we arrived back to where Jane and some of her staff had prepared us a feast of fruits and drinks to replenish. I sat with Jane and Olsen and chatted about their passion for the land. Olsen told me that in 2011 the river dried up and it was the first time in recorded history that this had ever happened, so from then the whole village came together to work with F.E.P.S., who had previously held workshops on recycling and fundraised for rubbish stands for all the local families. They’ve also received funding from the G.E.F. Small Grants Programme (U.N.D.P.) and have published a book based on the story Olsen told us on the walk, retold by Va’afusuaga Sa-o- Ma’auga the 93 year old paramount chief of the village and beautifully illustrated by one of the local guides. One speech in particular had many people holding their hands to their hearts, Rev. Tuitoga Leota opened the ceremony with such beautiful words “When we talk about the Environment, we are talking about God’s creation and we must work together to save our water and forests”. Jane and Olsen from Lalotalie are absolutely wonderful examples of how ecotourism works here in Samoa. They’re making significant positive contributions to the environmental, social, cultural and economic well-being of their local community, keeping our culture preserved by empowering local villagers to protect and conserve their natural and cultural heritage through sustainable practices, I look forward to taking many more hikes with them. So, this is YOGA, to yoke and to bring together, that first seed planted by my friend Kari with the introduction to Jane and Olsen. What they are doing out there is bringing things together, in a beautiful way.